Learn how to use beeswax as a collage medium! Beeswax is a natural material that acts as a glue and preserver for all types of works on paper. Working on wood panels, students will be shown how to incorporate watercolor paintings, pastels, drawings and collage papers into new and exciting works of art. Using the unique properties of beeswax, students will work back into the new artwork with oil paint, pastels and oil pastels to create additional imagery and textures. Note: Beeswax is not compatible with acrylic paintings. More will be discussed about this in class. We will explore and discuss the power of intention and learning, that arise out of artistic concentration. Examples will be shown of how different cultures and artists, such as Frida Kahlo and the instructor, Judy Shintani, have used art and symbology for healing, health, and expression. 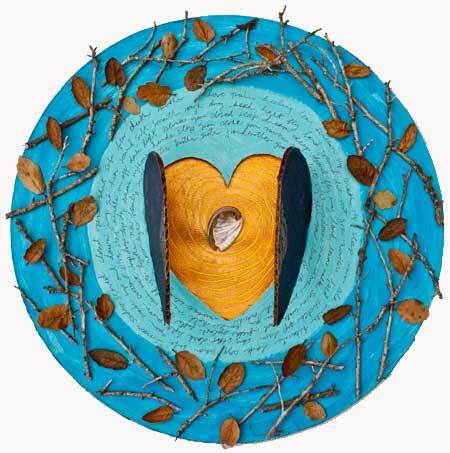 She will conduct a short visual meditation during which participants will tap into their own landscape and personal journey, which they can incorporate into their well being mandalas. See workshop details at this link.